- The lion from the logo is imprinted into the front of the shirt. Yellow and blue. Not the most common colour combination and I'm not sure if it's the most flattering combination either. I am a fan of the main yellow body though which holds both the logos and the sponsors. In 1972–73, Eintracht Braunschweig scrapped the original crest and replaced it with a new design based on the logo of their sponsor Jägermeister. This was initially done to get around the German FA's ban on shirt sponsors – a loophole in those rules allowed to club to put a very close looking symbol on their shirt as long as it was the club's official crest. 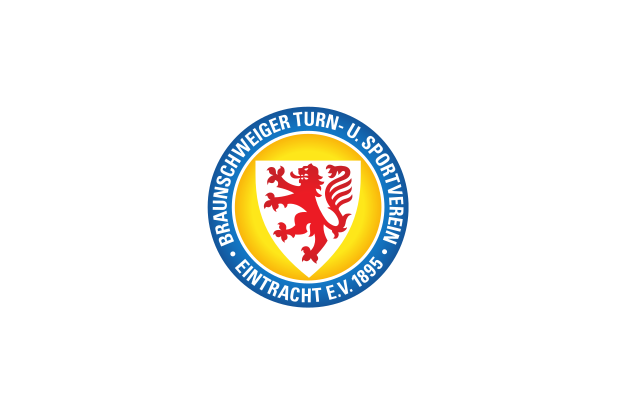 In 1986, after Jägermeister stopped the sponsorship of the club, Eintracht Braunschweig adopted a new, diamond shaped logo containing the traditional red lion as well as the club's colours blue and yellow.